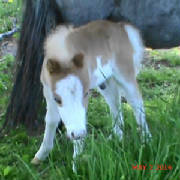 We had the 1st year in many that all our foals all arrived alive and healthy. We also cut back on the # of mares we wanted to foal out. We do have one more mare to foal, but she will not be due until August. 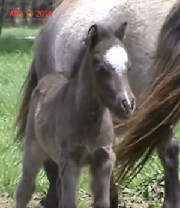 First born this year is a Blue roan filly by Olympian Magics Charade and out of Avalon Farms Roan Angel (aka Pearl). 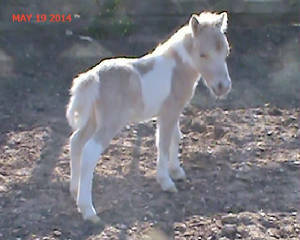 This filly was born 4/10/14 and measured 21 1/2" tall. I expect she will mature between 32 and 33" tall. She is going to stay here as a replacement for her mom. She is very correct with good bite and legs and has a very sweet friendly disposition. Her sire really has put some cute heads on his foals and we are really happy with his first foal crop. 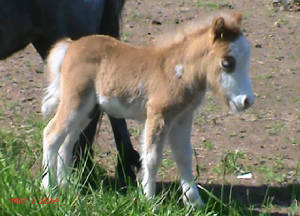 Pearl is our top producing mare, and has consistently produced black, roan or black based foals. 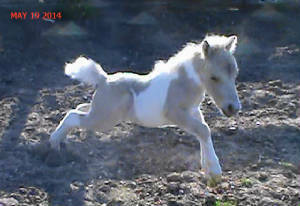 Second to arrive is this Cute Tiny Overo stud colt. Born 4/24/14 and only 17 5/8" tall, He was a little pistol from day 1. Full of sass and energy, he thinks he can rule the world. He is very refined and correct, I really think this colt would be a great stud some day and would probably be a winner in the small halter classes too. He is probably both frame and sabino. 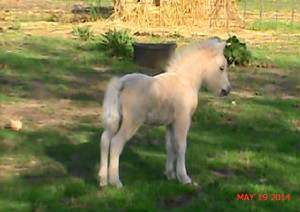 He will be for sale when weaned sometime in August, but I will take a deposit if someone wants him. 3rd to arrive is a palomino stud colt on 5/9/14. Measuring 21 1/2" tall, I expect him to be 32 to 33" tall. He will be AMHA and AMHR eligible. His dam is one I raise here Avalon Farms Shake Gold (daughter of Shake and Little man). His sire is Olympian Magics Charade our 30 1/2" sorrel overo stallion. This colt is so so sweet and friendly, I can't express what a wonder disposition he has, kids have surrounded him to pet him and he loved it. He is also a great mover and I think would make a great driving horse some day. His dam is just the same very sweet friendly in your pocket. He will be for sale when weaned I cant decide on a price yet. I will be open to offers. Number 4 is the tiny cute Palomino Pinto born 5/16/14, measured 18 3/4" tall I am guessing she will be about 29 to 30" tall mature. She is by Horses Ltd David (little man) and Spragues Billy Joyce (Shake). She is a full sister to Goldie (the mother of the palomino colt above). These photos were taken at 3 days old and she hasn't filled out much, I will add more photos of her later. What a cute and full of attitude filly this one is. We have decided to keep her too, her dam is 16 years old and I don't know how many more foals I can expect to get, plus she is only the 2nd filly her dam has ever produced!